Melt cocoa, coconut oil, and syrup together in a microwave-safe dish in 30-second intervals, or in a saucepan over medium heat, stirring semi-frequently so the chocolate doesn’t burn until the chocolate has melted. *If the chocolate becomes too thick, stir in 2-3 tablespoons more coconut oil. Line a muffin tin with muffin liners and then distribute HALF of the chocolate into the liners. Place the entire tin into the freezer for 10 minutes or so or until the chocolate has hardened. Meanwhile, make the filling by adding all the ingredients into a blender and pulsing until smooth. Remove muffin tin from the freezer then pour some of the raspberry filling into the muffin tins, then place the muffin tin back in the freezer for 5-10 minutes. NOTE: you don’t need to use all the raspberry filling. You can save some of it and add it to your morning smoothie or save it for your next batch of chocolate raspberry cups. 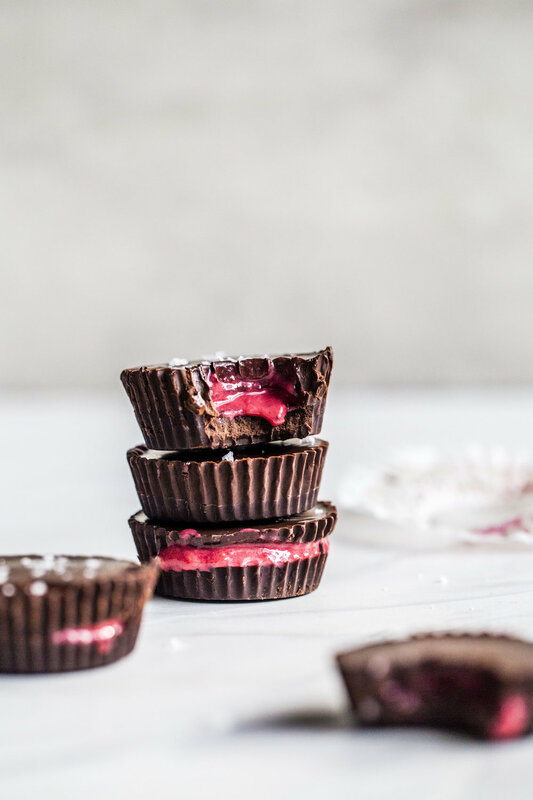 One more time, remove the tin from the freezer and pour the remaining chocolate over the top of the raspberry filling, dropping the muffin tin on your countertop a few times to smooth out the chocolate on top. Sprinkle chocolate with some sea salt, place the tin back in the freezer for 5-10 minutes, and enjoy as you please! **cups are best stored in the freezer up to one month. Sign up to receive our monthly musings.